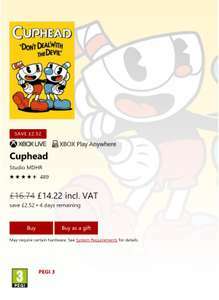 Cuphead the cheapest it's been on Xbox one £14.22 @ Microsoft. Also on PC - Xbox Play Anywhere. Thanks @cartergaz save an extra 45p from buying credit and 5% for FB like or using Apple pay. Been waiting for this to drop, the 30's style animation looks amazing. Well yes lol. It did have a bit off from CDKeys before but cheapest direct from Xbox store. Been waiting for this to drop, the 40's style animation looks amazing. Same here too. With all the snow that's about to hit us tomorrow and the likelyhood kids being off I think I'll buy it. Save an extra 45p by buying a £15 Xbox Gift Card on CD Keys with the 5%, and have 78p change for later. Also you can get the 5% everytime if you pay by Apple Pay. Save an extra 45p by buying a £15 Xbox Gift Card on CD Keys with the 5%, …Save an extra 45p by buying a £15 Xbox Gift Card on CD Keys with the 5%, and have 78p change for later. Also you can get the 5% everytime if you pay by Apple Pay. Cheers added that to info. Yes it's in the screen capture above confirmed 'Play Anywhere'. Yes it is. Also I've edited title to make it clearer (I hope). They got doom, skyrim, la noire and others running so possible. 1080p at 30fps. The switch is very underrated. The x1 nvidia processor is very efficient and simple to port to. Graphics are only slightly behind xbox one. They got doom, skyrim, la noire and others running so possible. 1080p at …They got doom, skyrim, la noire and others running so possible. 1080p at 30fps. The switch is very underrated. The x1 nvidia processor is very efficient and simple to port to. Graphics are only slightly behind xbox one. "It can run a couple of Xbox 360 games fine so it should be able to run Xbox One games"
I'm jesting =) but also the switch certainly isnt just behind xbox one in terms of graphical power... its just more powerful than the 360. I'm jesting =) but also the switch certainly isnt just behind xbox one in …I'm jesting =) but also the switch certainly isnt just behind xbox one in terms of graphical power... its just more powerful than the 360. Judging by Zelda, the switch could run Cuphead. Frame rate might be an issue though.